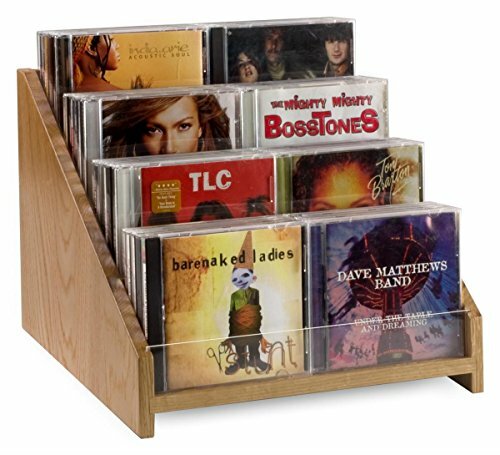 This wood CD/DVD rack for tabletop use holds up to 40 CDs or 24 DVDs. The 4-tier media storage holder is constructed from Oak and features a clear acrylic front panel to keep product in place. This wood CD/DVD rack measures only 12.375 inches wide and therefore takes up very little countertop space. The media storage display can be used in both residential and commercial settings to keep movies and compact discs organized while on display. The 4-tier design allows for titles to be viewed while remaining in place. 4 tiers keep CDs and DVDs organized. Holds 40 CDs or 24 DVDs. Clear acrylic front panel keeps product in place yet won't block artwork.